Prices are in US Dollars (USD), before any applicable taxes. The pricing reflects twin-sharing, per-person costs without airfare to/from the tour; however, we can book flights from your home airport for an added cost. Contact us for a no obligation quote. Optional Single Supplement: $1458 USD (number of singles limited). What do you get if you mix the incredible cultural riches of Italy's north with the laid back beauty of Southern Italy? You get one of the best guided tours of Italy encompassing the elegant beauty of the Roman Empire's most iconic buildings, a curated look into one of the world's largest collections at the Vatican, postcard perfect settings on the Amalfi Coast and Cinque Terre, a cruise along the canals of Venice, and so much more. Our guided tours of Italy are the chance to understand first hand why this destination captures the heart of all those who enter its borders. In Southern Italy, it is easy to get lost in the island lifestyle of Sicily. Markets are filled with fresh fish and the countryside is lined with orange and lemon trees. Fresh ingredients make mealtime a treat, while the days are complete with wanderings across ancient Greek temples and medieval cities, with a backdrop of active volcanoes and a rugged landscape. Our guided tours of Italy vary from walking tours in old city squares to discovering the buried city of Pompeii, a city frozen in time beneath volcanic ash and pumice stone that covered the city nearly 2,000 years ago. 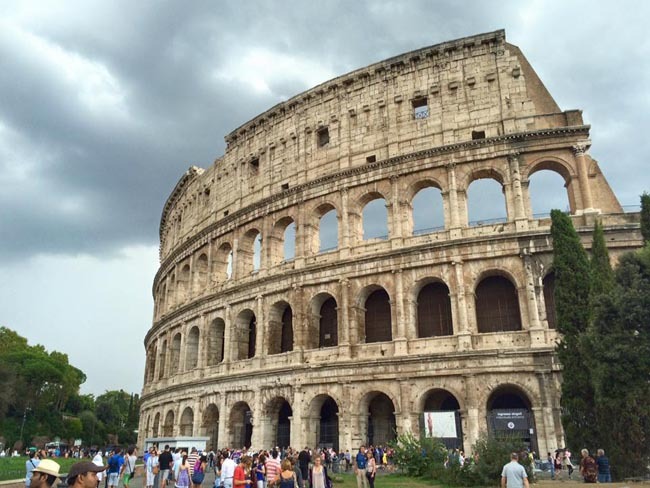 Take a step back into the days of the Roman Empire with a guided tour of the colosseum, an arena which held nearly 55,000 spectators, before venturing into the Roman Forum and onto the Spanish Steps. Rome is a city so vibrant it practically hums, replete with squares designed by Michelangelo and fountains by Salvi. Rome contains the walled state of the Vatican, itself home to the amazing collections at the Vatican Museums. It is easy to understand how Italy inspired the great minds and artistic legends of history particularly as we tour the Tuscan countryside. 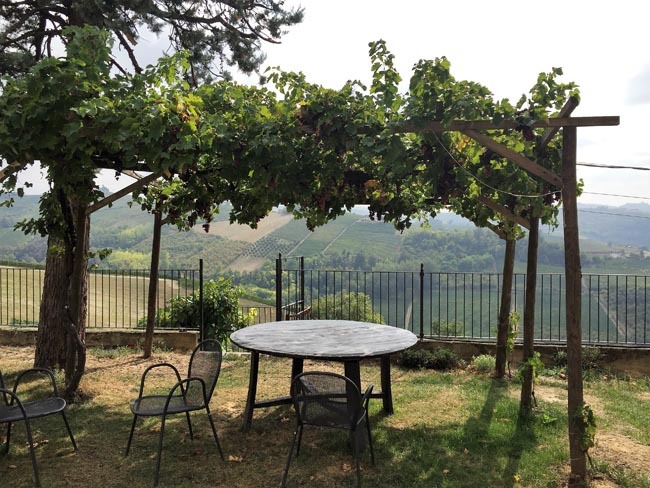 We are surrounded by endless grape vines clinging to rolling hills, stretching towards timeless cities such as Siena, or medieval fortresses such as that found at San Gimignano. More inspirational sights are revealed on a cruise along the windy road cut into the rock on the Amalfi Coast, or strolling from village to village in the brightly coloured Cinque Terre. Indeed, much of Italy feels like a step back in time. Life moves at a slower pace in the fertile plains, where wine and balsamic vinegar are created. Step back in time to see the Byzantine monuments erected after the 5th century in Ravenna. Some might conclude that the rose coloured buildings of Verona make it among Italy's finest towns, while others may conclude that it is Venice's canals or Agrigento's Greek Temples or Palermo's markets that stole their heart. Wherever you go on our guided tours of Italy, it is a sure bet that it will be one that is both memorable and inspiring. You know when a tour leader has done his/her job when you feel you have made a new friend. Such is the case with Laura. Cannot sing enough praises for Laura. Thank you. Loved Italy especially Venice. Would return again sometime in the near future. I thoroughly enjoyed all excursions on this tour. There are no excursions to be eliminated or improved. All excursions were excellent. All local guides were excellent and offered informative information of the local sites that we visited. The transportation was excellent. Yes, the evening meals met my expectations. All evening meals were excellent. Yvette is a very outgoing, communicative and caring tour leader. Yvette was very helpful during the tour. She always went above and beyond to ensure that we were enjoying the tour to the fullest extent. Yvette's organization skills were excellent. She ran a perfect tour for us. Yvette's general and local knowledge was excellent. She augmented the information shared by the local guides on the tour. Don t ever lose her. (Laura) Excellence cannot be improved upon. This tour is good value for money. We enjoyed the balsamic vinegar excursion in Modena, as well as the excursions to Pisa, Palermo Monreale, Sienna and Vatican City. All local guides were very good. The food was excellent. All buses and drivers were very good. The tour leader was first class. Today we arrive in Palermo and transfer to our hotel. 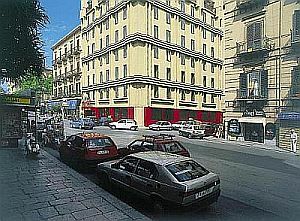 Palermo is the capital of both the autonomous region of Sicily and the Metropolitan City of Palermo. The city is noted for its history, culture, architecture and gastronomy, playing an important role throughout much of its existence; it is over 2,700 years old. To gain an initial understanding of the city's unique culture, start by wandering the streets of the old city. The mix of architectural styles points to the wave upon wave of invaders who have claimed the city as their own, as does the look of the locals. We begin our day with a walk through the narrow streets of the Il Capo outdoor market. Here we feel the very pulse of the city's daily life, passing stalls where fishmongers display whole sword fish and tuna, and several varieties of squid and octopus. 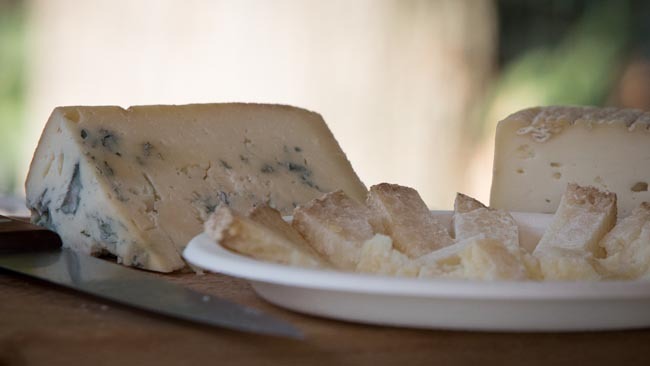 Sicily is agriculturally rich and here some of the island's excellent produce is displayed: apples from the slopes of Mount Etna; oranges and lemons, introduced to Sicily by the Arabs; cactus pears, fresh figs and grapes, fat olives, fresh capers, zucchini blossoms, fresh ricotta and pungent pecorino cheese. A short walk brings us to the Piazza Praetoria with its voluptuous 16th century Florentine fountain, decked with renaissance nudes and animal heads. At its unveiling, centuries ago, locales named it "the fountain of shame". Nearby is the baroque Quattro Canti, the 17th century crossroads that divides the old city into four, and the Municipio, a 15th century palazzo that is Palermo's city hall. On the Piazza Bellini, we step inside the Martorana Church; a 12th century building that is a jewel of Arab-Norman architecture, and its interior encrusted with byzantine mosaics. And no visit to Sicily would be complete without a stop at Monreale, the Royal Mountain. It was here, at the end of the 12th century, that the Norman king, William II had a great cathedral built to reflect the sophistication and wealth of his kingdom. Byzantine and Greek artisans were employed to cover almost every surface of its interior with costly golden mosaics depicting Christ the Pantocrator, the apostles, and cycles form the Old and New Testaments. Next door, we walk through the cloister of the Benedictine abbey. Here, no two of the exquisite capitals on over 200 twin column are the same. En route to Erice we stop at Segesta to see the picturesque Doric temple. Sicily was part of ancient Magna Graecia. In the 8th century BC, with population rising dramatically in mainland Greece, land became expensive and resources scarce. This led to an exodus of Greeks in search of new lands. Sicily and southern Italy were to Ancient Greece what the Americas were to 16th century European explorers: the great unknown; a land of possibilities, riches and great dangers. Segesta was a successful colony, which fought with its rival Selinunte, to the south. We continue the short distance to Erice and have a walking tour upon arrival. Erice sits dramatically on a promontory at over 600m (2,000 feet) above the sea. The ancients considered it a sacred place; the Arabs called it Jebel Hamid, or Blessed Mountain. We enter the Carthginian Porta Trapani, passing the Chiesa Matrice, a beautiful Normanesque Gothic church built in the 15th century. Near the main square you might like to sample some Sicilian sweets at a local shop where they are made to order. The Arabs are credited with the introduction of the local fondness of desserts, including gelato for which Sicily is famous. Farther along we come to the site where once the temple of Venus Erycina stood. From the Norman Castle, now standing in its place, the views out to sea are splendid. On a clear day, we might even see the coast of Tunisia, 145km distant. Erice is home today to an important scientific institute where international conferences and symposiums are held year round, giving Erice the sobriquet, "City of Science". Today we travel by road to Agrigento via Marsala and Selinunte. We depart Erice for Marsala, a Arabic name meaning "Harbour of God". Here, in 1860, Garibaldi landed with his army of a thousand redshirts to take Sicily from the Spanish Bourbon rulers. In the previous century an Englishman named John Woodhouse saw the potential for a lucrative export, fortified wine, which became all the rage, especially after Admiral Nelson supplied it to his sailors instead of rum. While in Marsala we visit the museum and enjoy a wine tasting. Our journey through the lands of Magna Graecia continues to Selinunte where we have a full site tour. The ruins of Selinunte are some of the most impressive of the ancient Greek world, and the site is one of the most captivating in Sicily. Selinos (as it was known to the Greeks) was once one of the richest and most powerful cities in the world, with over 100,000 inhabitants and an unrivalled temple-building program. The city was forgotten until the middle of the 16th century, when a Dominican monk identified its location. Excavations began in 1823, courtesy of two English archaeologists. We continue to the magnificent series of temples at Agrigento. The five elevated temples are a picture-perfect tribute to the indomitably of paganism. Time, earthquakes, vicious Punic Wars, and the rise of Christianity have taken their toll, and the temples have been named official World Heritage landmarks. This morning we tour the Valley of Temples at Agrigento. Then, leaving behind the ancient Greek world, we drive inland across the island where, near the town of Piazza Armerina, we explore the remarkable ruins of a Roman villa. Built at the end of the 4th century AD, this vast complex which includes extensive baths, reception rooms, and private apartments may have been an imperial villa of Diocletian's co-emperor, Maximianus. The villa contains some of the most beautiful and extensive Roman mosaics to be found anywhere, including detailed and colourful hunting scenes, images from mythology, and a charming sequence of bikini-clad ladies doing aerobics! We continue to Enna where you will have some free time to explore the town. See the Castello di Lombardia or Torre di Federico II for stunning views; your Tour Leader will point you in the right direction. Today we drive toward the eastern side of the island, coming within sight of the slopes of Mount Etna. At 3313 m (10,866 feet), Etna is one of the earth's most active volcanoes -- both a blessing and a curse for the local people. The surrounding lands are extremely fertile, but there looms the constant possibility of an eruption. The nearby city of Catania was almost completely buried by lava flows in 1669. We arrive at Syracuse and tour of the Archaeological Park, including the Greek theatre, Monumental Altar of Hieron II, and the Latomia del Paradiso (quarry with the Ear of Dionysius). After a break for lunch we have a walking tour of Ortygia (old Siracusa), wandering the narrow streets of the old city where we see the Temple of Apollo, Fountain of Aretusa, the main piazza, and the Duomo, a former Temple of Athena. Free time to explore. This morning we depart Siracusa and drive up the east coast, with stunning views of Mt. Etna, to Taormina. We make a detour and drive up the side of Mt Etna -- have a sweater handy as we'll be approaching 1800m / 6,000 ft! On arrival in Taormina we'll have a leisurely walking tour of the town, starting with the almost perfectly preserved Greco-Roman amphitheatre, Taormina's greatest treasure. In ancient days, the 3rd-century cliff-side arena seated 5,000 spectators, with Mount Etna framed perfectly as a backdrop to the 1,800 year old stage. We see also the Palazzo Corvaia with its blend of Arab, Norman, and Catalan elements where, in 1410, Sicily's first parliament was convened. The Corso Umberto I is a charming pedestrian street that runs the length of town. There are many shops and boutiques along the way and at the Piazza IX Aprile, there are lovely views of Naxos harbour and the Italian mainland across the straits. Perched on a peak above the town is the medieval fortress. In the Piazza del Duomo where Taormina's 15th century basilica/cathedral stands, there is a fountain topped by the symbol of the town: the statue of a female centaur. Overnight in Taormina (or nearby Giardini-Naxos). This morning we take a short ferry ride from Sicily to the Italian mainland and then proceed by motor coach to Paestum. The three Doric Greek temples of Paestum are among the best preserved in the world, even rivaling those of Sicily and Athens. Originally built without any mortar or cement (they were simply covered by roofs of terra-cotta tiles supported by wooden beams) the temples remained standing even after the great earthquake of AD 69 reduced Pompeii's streets to a pile of rubble. After a period of native Italian control in the 5th and 4th centuries BC, it fell to the Romans in 273 BC and was renamed Paestum, remaining a Roman town until the deforestation of nearby hills turned the town into a swampy mush. Plagued by malaria and syphilitic pirates, Paestum's ruins lay relatively untouched until they were rediscovered in the 18th century. Today we travel to Naples where we see the colourful harbour front and the Castel dell'Ovo, a 12th-century fortress built on the ruins of an ancient villa, before our visit to the National Archaeological Museum. This impressive facility houses one of the world's most comprehensive collections of Greek and Roman antiquities. The museum stands on top of Santa Teresa Hill and was originally built as a military barrack later transformed into a university campus. It was remodeled in 1790 to receive the treasures of Pompeii and Herculaneum. Our next stop is the ancient site of Pompeii. Dug out from the inundation of volcanic ash and pumice stone that covered it by the eruption of Mount Vesuvius in AD 79, the entire area is a fantastic record of how ordinary Romans lived their lives. 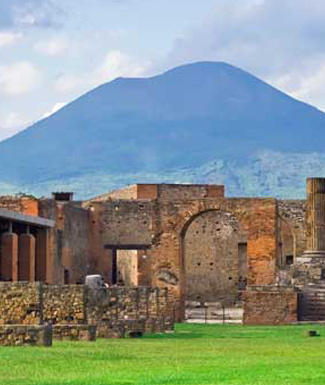 We will see the House of Vetti, the most elegant of the Pompeii villas and we also look at the House of Mysteries. The nearby House of Faun takes up a city block and has four different dining parlours and two spacious gardens. This morning we visit Herculaneum, a small town that was buried under Vesuvius's lava. Our tour here will include the baths, which were built during the reign of Agustus. An outstanding example of how the aristocracy lived is provided at the Casa dei Cervi. We then drive along the famous Amalfi Coast on a winding road carved out of the rock in the mid-19th century. This scenic and unforgettable drive takes us to Amalfi, a resort town on the peninsula of the same name where we take a walking tour of the city. We will see the beautiful Duomo cathedral with its 13th century bell tower, the main square of the town, and the Cloister of Paradise. Today's journey takes us to north to Rome via Monte Cassino. During the Roman Empire, the abbey located here was one of the great European centres of Christendom and one of the largest repositories of ancient learning. In 1944, Monte Cassino was destroyed by the Allied forces who suspected that it was occupied by German troops. The military cemetery on the nearby hill contains the graves of 1,100 Polish soldiers who lost their lives in the final assault. Later we continue to Rome. We begin our guided tour* of Rome at the 2,000 year old colosseum. Built to seat 55,000 spectators, this arena staged Rome's most brutal gladitorial combats. 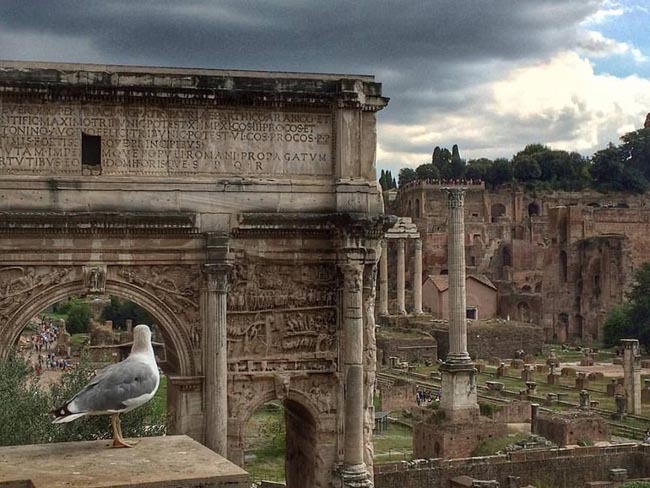 Next we walk through the Roman Forum where we will see the Curia, the Rostra, the Temple of Vesta, the Basilica of Constantine, and the Arch of Titus. Continuing onwards and upwards we reach the Campidoglio (Capitoline Hill), seat of the Roman Senate since the 12th century and the original citadel of the city. This beautiful square was redesigned by Michelangelo in the 16th century. 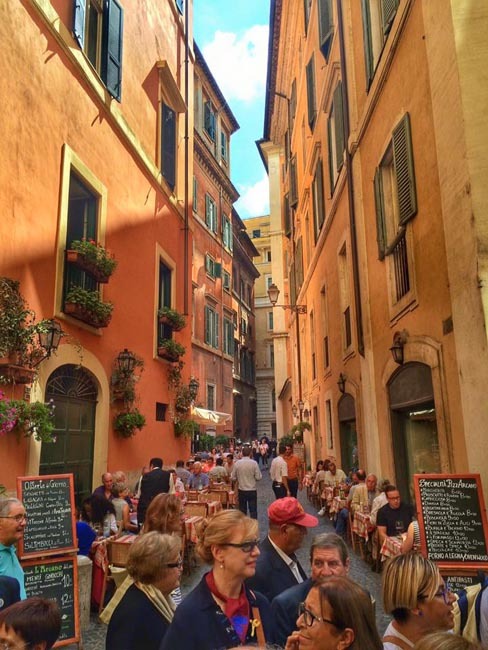 We arrive at Piazza Navona where we can break for lunch at one of the many restaurants and cafes on or near the square. In the square itself we can admire the impressive Fountain of the Four Rivers, with detailed figures representing the Nile, Ganges, Danube and Palata rivers. We continue to the famous Trevi Fountain, designed by Nicholas Salvi in 1732. Its water was supplied by one of Rome's earliest aqueducts. Throwing a coin into the fountain is said to ensure your safe return to Rome. We also visit the temple-turned church called the Pantheon, and have the opportunity to admire its perfect proportions on our way to the Spanish steps, where we finish our day's tour. Balance of the day at leisure. * NOTE: Due to traffic problems and the fact that today's sites are reasonably close to each other, much of today's tour will occur on foot and with Rome's efficient public transit system (cost of tickets included). Today we begin our visit to Vatican City with a guided tour through the immense Vatican Museums. * This amazing collection houses some of the most important Greek and Roman sculptures, Renaissance paintings, Flemish tapestries and mosaics in the world. Understandably this collection is visited by more than 3 million people a year. We also visit Michelangelo's Sistine Chapel to take in its breathtaking frescoes. Heading into the cavernous interior of St. Peter's Basilica, we can appreciate it's many treasures, including Michelangelo's Pieta. At the end of the tour we visit the elegantly symmetrical Piazza St. Pietro. * NOTE: The timing of today's sightseeing can vary depending on seasonality. Early spring and late fall tours can often begin in the morning due to lighter crowds at these times of year. Busier times often dictate an afternoon visit in order to avoid morning crowds. Weather may also be a consideration. Your Tour Leader will advise further upon your arrival in Rome. This morning we drive from Rome to Siena, a region famous for its wines. Our first stop will be Assisi. Despite the millions of tourists and pilgrims it attracts every year, the hometown of St Francis remains a beautiful and tranquil refuge. St Francis was born here in 1182 and his spirit hovers over every aspect of the city's life. He renounced his father's wealth in his late teens to pursue a life of chastity and poverty, founding the order of mendicant friars known as the Order of Minors (the Franciscans after his death) which attracted a huge following in Europe. St Francis' Basilica is the city's, and possibly Umbria's, primary attraction. Unfortunately, this peaceful town was hit by a strong earthquake on the morning of the September 26, 1997. During the initial shock, the Basilica of the upper church was damaged. An aftershock later that day brought the cupola down. The community of Assisi with assistance from individuals and organisations worldwide have restored as many Assisi's priceless masterpieces as possible. After a guided tour of the Assisi Basilica we depart for Siena, arriving later in the afternoon. Siena is best seen on foot. In fact, the city council was Europe's first to ban motor traffic from the city centre. Siena today seems frozen in time. The town has traditionally been Florence's rival as the centre of art and architecture in Tuscany. While Florence is known for its Renaissance art and buildings, Siena takes us straight back to the Middle Ages. Perhaps by preserving its original character more than any other city in Italy, Siena is a showcase of the Italian Gothic style. The walled city of Siena occupies three hill tops and contains a rich artistic heritage. Included on our guided walking tour of Siena's charming medieval streets and squares is a visit to the Palazzo Pubblico (Town Hall), a famous example of Italian medieval architecture with Gothic influences. Also famous for its frescoes, the best-known are a secular series on government in the Hall of the Nine (also known as Sala della Pace), by Ambrogio Lorenzetti. These frescoes are collectively known as "Allegory and Effects of Good and Bad Government." Our next stop is the Duomo. This huge cathedral, built in bands of black and white marble, dates from the 12th century. Built in the Romanesque and Italian Gothic styles, it has a dramatically painted façade -- partly designed by Giovanni Pisano -- and a soaring black and white bell tower. The inlaid marble floor depicts different Biblical scenes and the cathedral contains a glass-enclosed box with an arm. Tradition maintains that the arm is that of John the Baptist and was used to baptise Christ. This afternoon we drive to San Gimignano, called the Manhattan of Tuscany. The medieval town preserves 13 of its noble brick towers, which give it a skyscraper skyline. Today its fortress-like severity is softened by the subtlety of its quiet, harmonious squares, and many of its places and churches are enhanced by Renaissance frescoes. Our drive this afternoon back to Siena takes us through the wine growing region of Chianti. This morning we drive through beautiful and quintessential Tuscan rolling countryside to Volterra. Situated like many Etruscan cities on a high plateau, Volterra offers uninterrupted views over the surrounding hills. In many places the town's ancient Etruscan walls still stand. The exact origins of the Etruscans and when they arrived in Italy, are unknown. Their civilisation was centred in the area between present-day Rome and Florence, and had its Golden Age from the eighth until the sixth century BC. After this period the Etruscan empire was gradually superseded by the rising power of Rome, although in the process, the Romans incorporated many aspects of Etruscan culture into their own society and beliefs. Although the Etruscans had their own language and alphabet, nothing of their literature has survived. What we know of their civilisation comes mainly from their highly decorated tombs which were stocked with everything the deceased would need in the afterlife -- food, drink, clothes, weapons and furniture. We visit Volterra's famous Museo Guarnacci, which contains one of Italy's best collections of Etruscan artifacts. Pride of place in the museum goes to the collection of 600 Etruscan funerary urns, depicting many aspects of Etruscan customs and beliefs. We also visit the city walls and the Etruscan Gate with its basalt heads of Etruscan gods dating back to the sixth century BC. Before leaving Volterra we view the Roman amphitheatre, dating to the first century BC. This is one of the best preserved Roman theatres in Italy and enough of the original structure has survived to allow an almost complete reconstruction. Our next stop is Pisa, where we will spend most of our time concentrating on the town's principal monuments -- the Duomo, the Baptistery, and the most famous structure in Pisa, the gravity-defying "Leaning Tower." We will take ample time to view and photograph the tower from the outside (to climb the tower requires advance reservations and a considerable amount of time to queue for entry; time constraints make this impractical for our tour). We continue to Lerici, set dramatically on a beautiful bay on the Ligurian coast. Those not wishing to continue with the next two more difficult sections may walk up to Corniglia centre to sample the delightful town with its wonderful panoramic views. It is also possible to take a local train to the nearby town of Vernazza to enjoy this jewel of a village. Those wishing to continue may start on the 2-hour hike to Vernazza. The hills of the rugged coast are covered in vineyards which grow the grapes for the local Morasca, Chiaretto del Faro and Sciacchetra wines. 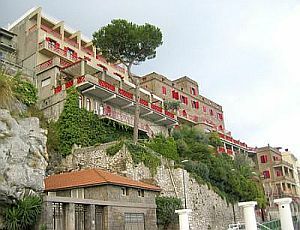 We continue by train to Monterosso Al Mare, thus named for the red colour of the area. Here we find a large statue carved into the cliffs and a lovely beach. * PLEASE NOTE: Due to the flooding that occurred in the region in late 2011, our day may need to be adjusted depending on what trails are open or under repair, and any repairs or re-construction occurring in the impacted villages. Tonight we arrive in Florence. Florence is a city steeped in history and art. Our walking tour today begins with a guided tour of the Accademia, which was Europe's first Academy of drawing and today houses a superb art collection, including Michelangelo's David, probably the most famous statue in the world. We then proceed to the Cathedral of Santa Maria del Fiore (Duomo), complete with its magnificent red dome. Upon its completion in 1436, the dome was hailed as the greatest architectural achievement of its day, equaling, perhaps even surpassing, the monuments of antiquity. The cupola's diameter is greater than that of St Peter's in Rome and the nave is the third largest in Christendom. Even today its brilliant engineering is not fully understood. We continue along the pedestrian mall to the Ponte Vecchio, the oldest bridge in Florence and the only one in the city to survive World War II. The Ponte Vecchio was built in 1345 and used to be lined with butchers' shops which have now been replaced by rows of gold and silver shops on both sides. At the Piazza Santa Croce, we stop to admire the facade of the Franciscan church of the same name. Inside we see the tombs of Michelangelo and Galileo Galilei and chapels covered in frescoes by Giotto. Balance of the day at leisure. The afternoon is free to take in the atmosphere of this sophisticated city. From Tuscany we drive into the region of Emilia Romagna, an area of fertile plains surrounding the Po River. The area is known for balsamic vinegar, and today we'll visit an acetaia where balsamic vinegar is produced. We will see the machinery, cellar, the barrels, indeed the whole process and all the products that result. We arrive in Ravenna, an incomparable treasure-store of Byzantine monuments. Ravenna was made capital of the Western Roman Empire in AD 402 as Rome was threatened by the unstoppable Barbarians. Later in the fifth century Ravenna also succumbed, but was recaptured in 540 by the Byzantines under the emperor Justinian. From the sixth to the eighth centuries Ravenna flourished as a great centre of Byzantine (Eastern Orthodox) culture and religion. Its influence came not from the rest of Italy but from Constantinople (today's Istanbul). Today the humble-looking churches of Ravenna house the most spectacular Byzantine mosaics outside Istanbul. We visit the spectacular mausoleum of Galla Placidia, a Roman princess who married a Barbarian chief. The walls, floor and ceiling of her tomb are completely covered in dazzling decoration. The Mausoleum of Theodoric, built in AD 520 to house the mortal remains of an enlightened ostrogothic ruler, has a dome cut from a single block of stone weighing almost 336 tonnes (300 tons)! Later we visit the Basilica of Sant Appollinare in Classe with its stunning mosaics, and also visit the Basilica di S. Vitale. Today we will also have a walking tour of the charming streets of Medieval Ravenna. Today we drive from Ravenna to Verona via the Colli Eugani region, known in English as the Eugenian Hills. This glorious area is well-known for its thermal springs and terrific wines. Onto Verona, the setting for Shakespeare's 'Romeo and Juliet'. With its pink marble Roman structures and rose-painted buildings, Verona is one of Italy's most appealing towns. The town contains many Roman ruins including the first century Arena which is now used as Verona's opera house, the third largest such structure in existence. The Teatro Romano is often used for the performance of plays, particularly those of William Shakespeare. During our time in Verona we'll have a walking tour starting with the Piazza Bra, the centre of Veronese life. We'll wander the rosy-hued streets admiring the palaces, townhouses and churches. We see the Gothic mausoleum of the Scaligeri rulers of the 13th and 14th centuries. We also visit the family's fortified residence on the River Adige and a bridge named after them. We begin our walking tour of Padova with a visit to the towering Basilica of Saint Anthony, patron saint of lost things. With its minaret-like towers and byzantine cupolas, the structure is a blend of eastern and western elements and a focal point for a constant flow of pilgrims. When we step inside its precincts, we leave Italy and enter the Vatican State. This is the only Vatican property (apart from Vatican City) in Italy that is extra-territorial. We continue on to the small Scrovegni Chapel, situated near the town centre. Here we view exquisite frescoes by Giotto, who led the way to the Renaissance by piercing the wall of two dimension and introducing perspective and humanism into painting in the fourteenth century. We also visit a unique structure -- Europe's oldest permanent anatomy theatre, built in 1594, with viewing balconies so narrow that when students fainted they would be prevented from falling. After a short walk from the university we come to the Piazza Bo, the scene of one of the liveliest daily markets in Italy. We then travel the rest of the distance to Venice by road. After a brief orientation by your Tour Leader, you will have free time this afternoon for independent exploration. This evening you may choose to visit the casino, take a gondola ride, or perhaps spend an evening at the theatre. 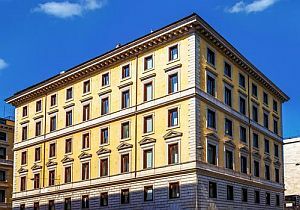 On our guided walking tour this morning we concentrate on St Mark's Square, surrounded with elegant, historic buildings. Napoleon called Piazza San Marco, "the drawing room of Europe". We start with a tour of the Doge's Palace. This former seat of Venetian power has the second largest wooden room in Europe. Of interest as we walk through the council rooms, is Tintoretto's Paradise over the Grand Council Chamber -- alleged to be the largest oil painting in the world. The palace is connected to the old prison by the 'Bridge of Sighs.' In the late 16th century the decision was made to build new airier prison cells to replace the original dark dungeons. It was from this new prison that Casanova made his daring escape across the rooftops in 1755. The highlight of the square is St Mark's Basilica, a Byzantine masterpiece. This cathedral was begun in 830 to house the tomb of St Mark whose relics were stolen from Alexandria in Egypt. The inside walls are encrusted with precious art, rare marbles and magnificent mosaics. Behind the altar is the famous gold altarpiece, 'Palla d'Oro,' which is one of the finest examples of gold craftsmanship. Later we take the vaporetto, or public water bus, on the Grand Canal and then walk along the maze of canals, sidewalks and bridges that are uniquely Venice. At the Rialto Bridge we visit the market area. The name Rialto derives from 'high bank' because this area was one of the highest points on the islands that make up the core of Venice and was thus considered a safe gathering point. The market here is vibrant with locals buying fruit and vegetables brought in from the mainland, and a vast array of fish caught fresh in the Adriatic. *The red tour trail on the map does not represent the actual travel path. The following is a list of sample hotels at some locations included on this tour. The hotels shown here are meant to provide a general sense of the standard of hotel we usually aim for; they are not necessarily confirmed for your chosen departure. This centrally-located hotel features 94 rooms, with bathroom and shower, air conditioning, phone, mini-bar and colour TV and access to ...	web. Set in a restored 19th-century palace, this upscale hotel is a 3-minute walk from the Termini metro station and 8 ...	walk from Teatro dell'Opera. The Hotel Minerva is situated in the historic center of Siena and commands a view over the whole town. There ...	59 bedrooms with private bath, phone, colour TV, safe deposit box, air conditioning, fridge-bar, laundry service, WI-FI. 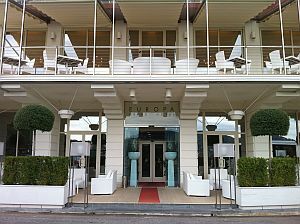 Only 250 meters from the historic center of Lerici and conveniently accessible by a stairway that leads from the hotel ...	the seafront and Piazza Garibaldi in only a few minutes, the Grand Hotel Europa is situated in the midst of a grove of olive trees on the hill of Maralunga, overlooking the splendid Bay of the Poets. 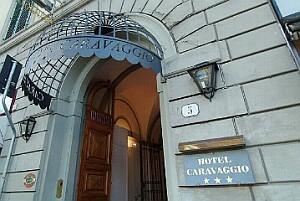 Hotel Caravaggio, is within a walking distance from the railway station and, most important, it is very close to the ...	famous monuments and museums, which make Florence unique. Hotel Caravaggio has 37 rooms with private facilities, equipped with satellite TV, telephone, minibar, air-conditioning, hairdryer, safe, laundry service, and WI-FI. Overlooking the Canal di Cannaregio, this refined, historic B&B in a palace dating from 1437 is a minute's walk from ...	vaporetto stop, and 2 km from both Piazza San Marco and the Rialto Bridge. Breakfast and dinner (mostly local restaurants) daily. All sightseeing and entrance fees for sites noted as 'visited' in the detailed itinerary. Gratuities for local guides, drivers, restaurant staff, porters. Airport transfers for land & air customers and for early arriving/late departing land & air customers who book their extra hotel nights through us. International airfare to/from the tour. Tour Leader gratuities, lunches, drinks, personal items (phone, laundry, etc), air taxes (if applicable), and excursions referenced as 'optional'. Airport transfers for Land Only customers. Our post-reservation trip notes offer further guidance on optional meal costs and shopping. This tour is offered in spring, summer, and fall, the most popular being spring and fall when temperatures are mild, crowds thinner, and air fares lower. Spring is popular with visitors who enjoy green landscapes and wildflowers. The region has a mild Mediterranean climate with early springs, long hot and dry summers, and autumns that are bright and warm into late October. Showers are possible in spring, rare in summer, and possible in fall. Transport throughout by private air-conditioned motor coach, 24-36 seats depending on ultimate group size (see 'group size'). Though we will have some full bus days, road travel is not particularly arduous as there are plenty of stops of interest and beautiful scenery along the way. Road are in good condition, though a little winding on some stretches. Short daytime ferry crossing. This trip is typical of most of our European tours, which are ambitious and involve full days of travel and sightseeing. While we don't have any actual strenuous activity (ie hiking) built into the program, you will do a lot of walking on this trip. These walks will mostly be in the form of walking tours of towns and cities and short walks to dinner. Being Europe, and a hilly/mountainous area, cobbles, uneven surfaces, and slopes/stairs are common. If you are accustomed to typical "bus tours," which rely heavily on vehicular transport for all sightseeing activities, you should be aware that this tour is considerably more active. Well-located, air-conditioned, mid-range hotels and inns (3-star) used throughout. Some hotels are smaller properties (3-4 story) that may not have elevators. All hotels have en suite bath, though some may have shower only. Porter service is sometimes available (see 'inclusions') though you should be independent with your luggage. Single rooms are limited and likely smaller than twins. Tour Leader throughout, driver (s), local step-on guides in various locales.